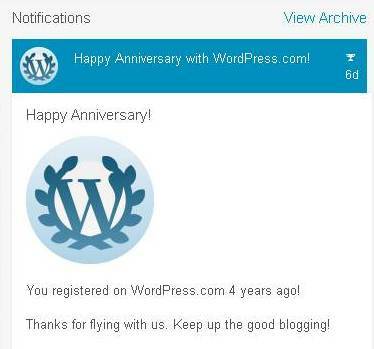 Today, I read this notification from WordPress, I think it was sent 6 days ago, saying Happy Anniversary! and that I’ve been registered on WordPress.com for 4 years! Wow! I didn’t realized it until today. 4 years is a long time. I never thought I would keep writing this blog that long. It’s been a nice journey, seeing how horrible my first writing was :D, how exciting when reading my previous travel journal again while remembering all those good times on those trips and how my writing improve since then.. There are 36,027 views so far. think that’s after I posted my travel journals to Thailand. There are 39 published posts in this blog at the moment which top 3 posts are “Home page / archives” with 13,491 views, “Budget Hotel (bali)” with 4,903 views and “Weekend Getaway in Bali” with 1,622 views. According to me: That stats is not bad, I guess, considering I don’t write often. I like writing and it’s the only place I could do it, free writing with no rules (except the blog rules ofcourse) about whatever comes in my head. So I enjoy it. Although there is also a slight disappointment in myself that I haven’t been able to make the time to finish all pending travel journals. I have like 3 journals to Bali, 1 journal to Karimunjawa in Central Java and 1 journal to Lombok that are still under drafting in the dashboard. There are also some photos that haven’t been upload into the published posts. Geez… I really hope I could find the time to complete them. If cannot, then I guess I would skip those journals. Meanwhile, I’d like to take this opportunity to thank all of you who has come and visit my blog. It’s been an enjoyable 4 years of writing, reviewing and sharing my travel experience and I am planning to keep doing it.